Broad Street Bus Depot has now closed but was home to Portsmouth's historic bus museum and housed many buses from various times in Portsmouth's past. The above picture was taken in the depot of one of the buses. The buses were housed here and restored by volunteers. They often ran free vintage bus trips round the city and there were sometimes film shows of bus history. Portsmouth has had Trams, Trolley Buses, Motorised Buses and Horse Drawn buses. There were examples of many of these at the depot for people to see. You could also see buses half way through there restoration, it was run by volunteers and was free to visit. Portsmouth's buses used to be run by Portsmouth City Transport, it was then run by Red and Blue Admiral and Provincial, and is now run by First Bus. The bus depot has now closed but the collection survives and has now found a home at Wicor Farm in Portchester but unfortunately is not open to the public except for pre-arranged groups. The group hope to run free services along the sea front once a month during the summer. 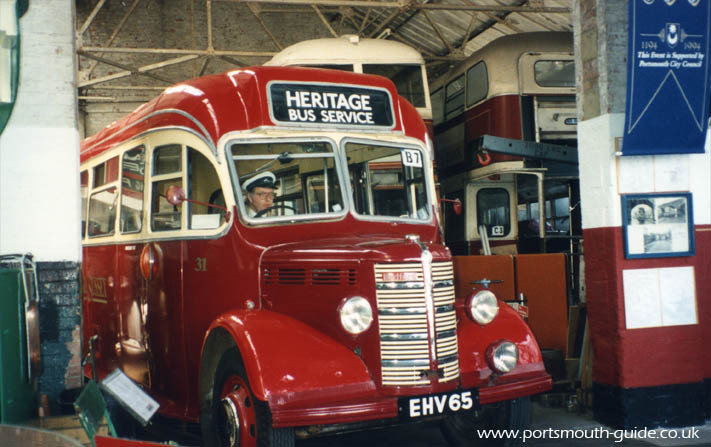 For more information have a look at the City Of Portsmouth Preserved Transport Depot website.